Are you ready for nightmares? 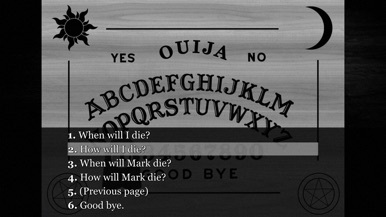 Interactive Horror Stories is a collection of 7 horror stories in which you are the hero. In the style of Choose Your Own Adventure; you make choices, they change the plotline and bring you different endings. You encounter various evil entities in this stories (humans are entity, too). The Doll is a story that begins as a classical possessed doll story, but ends differently. After Funeral is a modern gothic story. 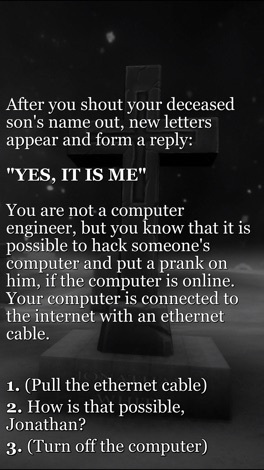 You receive messages those claim to be sent by your deceased son, who died three days ago. In "Crystal Skull", you are a king, whose daughter is ill and about to die. You hear about a miraculous crystal skull and have it brought to your palace in order to cure your ill daughter. But your man warns you that the skull might be cursed. Evil Beneath the Ground is about discovering an unimaginable horror that lurks beneath the ground. You are billionaire in Crystal Skull II this time. 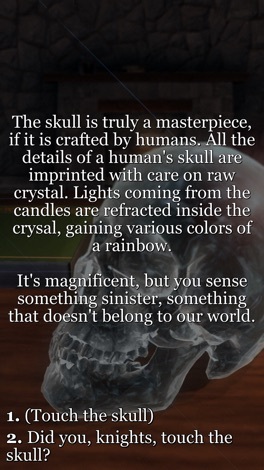 You buy the mysterious crystal skull and it talks to you. It says that it will bring you joys no mortal can ever reach, but it demands something first. Madness in Infinite Loop is a story about a man who is doomed to wake up to the same morning, no matter what he does. You want to die, but you wake up in your bed each time you die. When nothing you do matters, can you keep your sanity and morals? In "Ouija", you contact with an entity which claims that it's your deceased wife with a Ouija board, despite everyone warning you not to do. All stories have multiple endings. You can play the game both in landscape or portrait mode, however you wish. The crazy comic heroes of Make'n Omelette game are here to turn your conversations with friends and family into a fun experience! This sticker pack includes over 48 stickers of face masks, cartoon characters and animals like cows, chickens and sheep! This free app has property search, property listings, mortgage calculator, and allows you direct contact with your local agent RE/MAX Hallmark Realty. Handbags Sticker Pack! for iMessage. Hope you enjoy! Thank you for purchasing these stickers. Please see our other stickers by clicking on our name "Howtobewebsmart" in the app description above. With your support, we can frequently release new stickers in the app store!